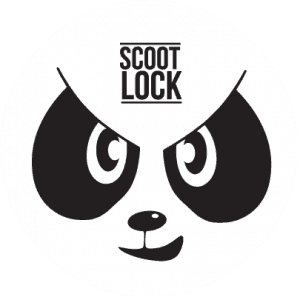 Unlike other locks, which get lost or left at home, SCOOT LOCK™ goes everywhere the scooter goes once clamped to your scooter stem. 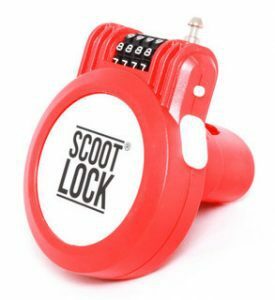 It is easy to attach, simple to use, and has a combination lock, rather than a key to worry about. 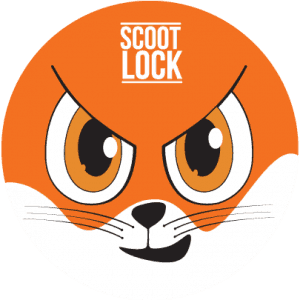 SCOOT LOCK™ is the solution. There’s no need to carry it and you can’t forget it. You clamp it to the scooter stem and there it stays. The reflective front badge included with every purchase helps your child to be seen in the dark. Choose from five bright colours to stand out in the scooter park. A 90cm long spring-loaded toughened steel cable, coated with plastic, allows it to be locked to many items. Can be moved to a bigger scooter as your child grows. Fits child, mini, micro, urban & adult scooters. Great for bikes & buggies too. Suitable for all Types of Scooters; Mini, Micro, Kickboard, Kickscooters, Urban, and Adult. Great for Bikes & Buggies too! My son loves it! We live on a boarding school campus where “borrowing” bikes and scooters has become a real nuisance. Since he got back to school on Jan. 3rd, many of his classmates tried to take his scooter but were surprised to to find out about the lock! Sweet revenge. Here is a picture, I know we mounted it wrong but it works great anyway! Thank you again so much! This lock is amazing. No longer have to carry a lock or keys for the kids, this is connected to the scooter. The kids find it very easy to use and gives them the responsibility of taking care of their scooter. WE LOVE IT!!! 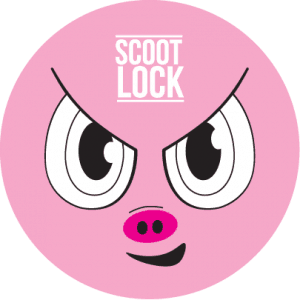 Thank you so much for our Scoot Lock! My son loves having it attached to his scooter! Not only is it safe and secure for the scooter it’s a great design and really easy to spot in a park. I understand they fit on bikes too so I’ll definitely be buying some more for the kids bikes! Great light lock for small bike/scooter. My daughter (4) has a bike and a scooter which she uses all the time to go to pre-school, the shops, swimming pool etc and I found it frustrating that we couldn't easily leave them outside without carrying quite a large and heavy 'traditional' bike lock with us. 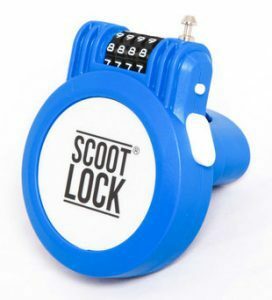 Having done some looking around I came across these scoot locks and ordered two. They are amazing! Attach permanently to the bike/scooter. Light so they don't cause a burden and small enough to not get in the way. Easy to fit. Feels solid enough. Had enough of carrying the scooter home from school but a bike lock just wasn't suitable. The scootlock is an absolute godsend, daughter can now scooter to school and leave it there without worrying it'll get pinched. It's easy to use and it's secure! 5.0 out of 5 stars Use on prams too! Fab! I use as a pram lock and it’s great! Love the fact it’s combination not key and also the wire is long enough to loop through the chassis, hood and seat of my pram so all nice and secure! Just what I needed. Great for leaving my daughter’s scooter at school during the day and looks cool as my 7 year old says. 5.0 out of 5 stars. 5.0 out of 5 stars. Great product. 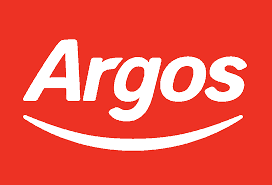 At first I thought it was a little pricey, but then I remembered that previously I've ended up buying multiple cheaper locks as they had got lost or we'd forgotten to bring one out with us. Attaches easily, very secure. Matches the green colour of my son's micro maxi scooter perfectly! Amazon Customer on 8 June 2018.Verified Purchase. 5.0 out of 5 stars. Great buy! 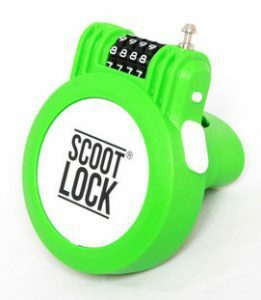 Really easy to fit onto my daughter's scooter, it means she can now scoot with me to the shops and lock it up safely outside.